To restore sight to damaged eyes, doctors often need to transplant the cornea - the transparent covering of the iris and the pupil - from a donor's dead body. There is a worldwide shortage, but one country, Sri Lanka, is doing its best to satisfy demand, without seeking any reward - at least in this life. Bandages cover Paramon Malingam's right eye. A tear appears in the left one. It is the relief of a very lucky man. "I thought I was going to live the rest of my life with one eye," he says. Thirteen years ago, Malingam, a shop owner from central Sri Lanka, cut his eye with steel wire. Last year, he injured the same eye with a piece of wood. After both accidents, a new cornea from a donor saved his sight. The cornea is the clear front part of the eye, which lets in light and helps focus images on the retina. When it's damaged, as a result of injury or disease, a person's sight deteriorates, sometimes to the point of blindness. Often the only solution is a transplant, but in many countries donated corneas are in short supply - a situation aggravated by the fact that they have a brief shelf-life. Harvesting of the eye must happen within a few hours of death and the cornea itself must be used on a patient within about four weeks, depending on the storage method. Malingam waited four days for his new cornea and is recovering at Sri Lanka's main eye hospital in the capital, Colombo. "After the surgery, I was reborn to the world," he says. A few doors down from his ward, Viswani Pasadi, a student, is preparing for a different kind of rebirth, by filling out a form at the National Eye Bank pledging her eyes when she dies. Like most Sinhalese - who make up 75% of Sri Lanka's population - Pasadi is Buddhist. She believes in a cycle of birth, death and rebirth, and sees this donation as a sound investment in her future. "If I donate my eyes in this life," she says, "I'll have better vision in my next life." Another who has taken this step is bookkeeper Preethi Kahlewatte. "Whatever good things we do in this birth, that will take into the next birth," she explains. "When the person needs something, we like to donate. Without hands, we can work. Without legs, we can work. Without eyes, what can we do?" According to the Eye Donation Society - a non-profit organisation founded by a young doctor, Hudson Silva, in 1961 - one in five Sri Lankans have pledged to donate their corneas. This does not include those, like Pasadi, who have signed up with the National Eye Bank, a separate institution which opened five years ago. "It seems like I've signed a certificate for every human being in Sri Lanka," says the Eye Donation Society's medical director, Dr Siri Cassim, whose job includes adding his name to the decorative papers given to donors' families. The eagerness of Sri Lankans to offer their corneas to others means that the country has long harvested more than it needs and has been able to send the surplus to other countries. The late Hudson Silva began this process in 1964, by packing a few eyes into an ice-filled thermos flask normally used for tea, and having them carried by hand on a flight to Singapore. In 2014, his Society exported 2,551 corneas, including 1,000 to China, 850 to Pakistan, 250 to Thailand, and 50 to Japan. The country's emergence as a major donor of corneas is largely down to Silva's dynamism. He made his first appeal for eye donations as a student in 1958, in a newspaper article co-authored with his wife and mother, urging Sri Lankans to "give life to a dead eye". The first corneas he received, the following year, he stored in his own refrigerator "along with the eggs and butter". Then in 1960 his mother died and it's said that Silva won the nation's heart by grafting her corneas on to the eyes of a poor farmer, and restoring his sight. Buddhist monks have also played a part in encouraging donations and teaching people to see them as an act of giving, or "dana", that will help them to be reincarnated into a better life. The venerable Kiribathgoda Gnanananda Thero, founder of the Mahamevnawa Buddhist Monastery in Sri Lanka, told me a story from the Jataka, an ancient book of poems about the Buddha's earlier lives. "In Buddha's previous life, he became a king. A blind beggar came to the palace and met the king. And he requested, 'Oh king, give me your eyes'. So he [Buddha] decided to give," he said. The Buddha's surgeon then removed the Buddha's eyes, and transferred them to the beggar, restoring his vision. "Generation to generation, we are listening to those kind of stories. So we are very encouraged to give our body parts to others," Thero says. He himself has already donated a kidney to a woman with kidney disease. The certificates handed out by the Eye Donation Society to those who pledge their corneas, explicitly allude to Buddhist teaching by carrying the words, "Let the donor have a good rebirth", though people from other religions have both made donations and received donated corneas. In Muslim countries it is generally forbidden to damage the human body, before or after death, so Pakistan and Egypt have been major recipients of Sri Lankan corneas. Malaysia, Nigeria, Sudan also feature on the list of more than 50 receiving countries. The cornea is one of the easiest tissues to transplant as no matching is required between donor and recipient. It is bloodless tissue, taking oxygen directly from the air. It is also possible to take a cornea from an elderly person, and graft it on to the eyes of a much younger one. If a donor is more than 80 years old there is a higher chance that the cornea will not be suitable, but it's reported that in one case the cornea of an 86-year-old Buddhist monk was given to a nine-year-old Jordanian boy. Despite this, in the UK at least, the cornea is the tissue donors are most likely to exclude from the list of organs they are prepared to donate - 11% of the total, compared with less than 1% who refuse to donate their kidneys. "I literally get this image of someone scooping out my eyeballs and it makes me really think," says one Londoner, Cenay Said, a camera assistant in the movie business. "Some of the biggest connections we make with people are through the eyes. They feel really personal." This may be one reason why, according to the National Eye Research Centre in Bristol, there is a shortage of corneas in the UK - though as there is no national waiting list for corneas, unlike some other body parts, experts are unable to say with certainty how big the shortfall is. When corneas are imported to the UK they tend to come from other European countries or the US - another major exporter - because the similarity in quality and safety standards makes it easier. 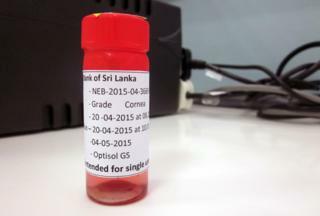 "This is not to say that the eye bank in Sri Lanka doesn't apply appropriate standards," says John Armitage of the UK's Corneal Transplant Service Eye Bank. "Rather it's a question of an eye bank in the UK having to fully audit the exporting eye bank to ensure compliance with the UK's standards." Surprisingly perhaps, the removal of a dead person's eyes is not a problem for families that want an open coffin at the funeral. Jayaratne Funerals in Colombo gets about six eyeless corpses a month. "The embalmers take two cotton balls about the size of the eyeballs," says director Hasanga Jayaratne. "They soak it in embalming fluid and put it inside the eyes and use a bit of glue to shut the eyes." Mourners are then able to see their loved-one one last time before the next life begins. This report was supported with a grant from the Pulitzer Center on Crisis Reporting. Images provided by Ross Velton, unless otherwise indicated.